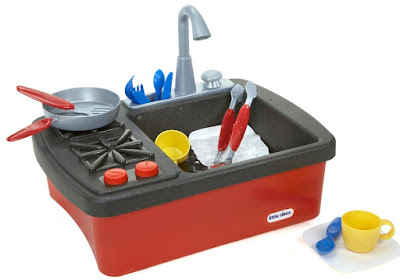 Little Tikes Splish Splash Sink & Stove - Only $10.98 + FREE Shipping! Check out this really fun Little Tikes Splish Splash Sink & Stove from Jet.com for Only $10.98 + FREE Shipping! Playing in the sink has never been more fun! The Splish Splash Sink & Stove is an affordable, portable and easy to clean product that will spark your little one’s imagination to play in the kitchen just like mom and dad. Kids will love the real working faucet that really pumps water! With 13 accessories, kids will have fun learning the basic functions of a kitchen. The possibilities are endless with the Splish Splash Sink & Stove. Features: Easy to assemble Real working faucet Clicking knobs Easy to clean Working drain Portable and easy to take on the go All accessories store in the base for easy cleanup.